Here is a little update from one of our new fosterers, Kate. A phone call from one of the Camberley Cat’s co-ordinators, Chris, signalled the arrival of my first foster cat for Cats Protection,Tia. Tia had been taken into the local vets by her owners because she was urinating around the house, outside the litter tray. They hadn’t been able to change her behaviour and decided to have her put down. The local vet recommended that Cats Protection got involved and the owner left Tia with the vet until I could collect her. 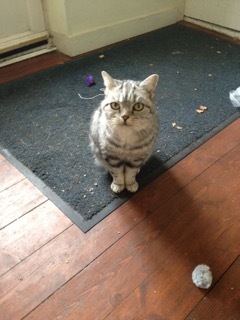 She’s a beautiful tabby grey pedigree type, probably a British Blue. Anxious and initially shy, over a few quiet days in my studio at the end of the garden it was clear that Tia was an affectionate little lady. She used her cat litter consistently and didn’t once urinate anywhere else, so whatever was causing this stress-related behaviour was no longer evident. She is quietly friendly and enjoyed some playtime, even venturing out into the garden briefly. At 8 years old, she is more difficult to rehome than a younger cat. After 2 weeks of living with me she was collected by the Cats Protection Newbury as they had a found a wonderful forever home for her. Next came along the lovely Blackie. 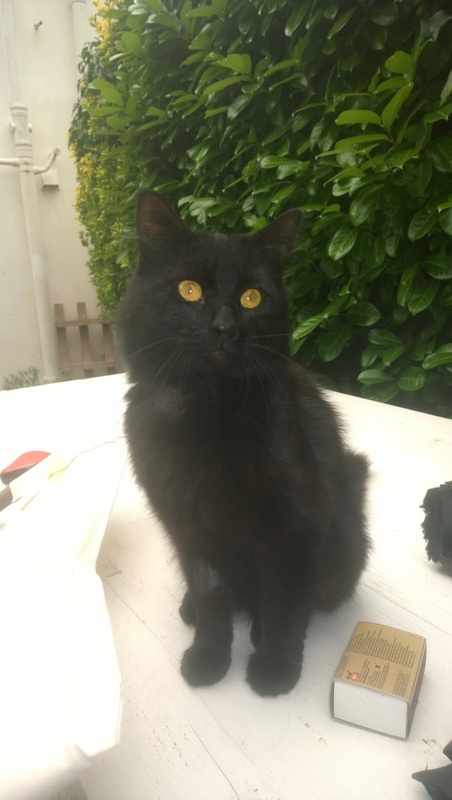 Blackie was a stray, tomcat with beautiful long-haired black coat. First thing was for him to be dashed off to the vets to be neutered. He then came to stay with me for a couple of weeks before staying at another foster home, and then on to a forever home with a new family. He’s a great family cat, confident and cheeky and chatty too. He loves people-time and was immediately affectionate and forward with me. He is certainly an outdoor cat and likes to explore, so it was hard to keep him indoors. Blackie is settling in well with his new family and although he was initially nervous of the toddler, he was very pleased to meet him.